Apr 20 Easter Food Basket Blessing in Seattle, Bellevue etc. The Consulate General of the Republic of Poland in Los Angeles kindly informs that the consular visit to Seattle, only to process passport applications, is scheduled for April 26 & 27, 2019. The Consul will be available at the Polish Cultural Center, by reservation only, 9 am to 5 pm on Friday and 9 am to 2 pm on Saturday. To make a reservation send an email to losangeles.kg.paszporty@msz.gov.pl with subject line "Dyżur w Seattle" stating your name, the PESEL number or the passport number and a preferred time. Where: at the Polish Cultural Center Dom Polski in Seattle, WA; reservations required. The Polish Film Club Kino OKO presents the movie Rose / Róża, directed by Wojciech Smarzowski and starring Agata Kulesza (Ida) and Marcin Dorociński. The movie swept the 2012 Polish Academy Awards receiving several Eagles, including Best Movie, Best Director, Best Actress for Kulesza and Best Supporting Actor for Dorociński. The film is a story set right after WWII in a newly Polish East Prussia, where a former resistance fighter trying to find a new life meets a Polish widow of a German soldier. Smarzowski is the author of two recent blockbusters of the Polish cinema: Wolhynia / Wołyń (2016) and Clergy / Kler (2018). Evening schedule: 7 pm socializing & film intro, 7:30 pm screening. This is the schedule for blessing of the traditional Easter food baskets in nearby churches on Holy Saturday, April 20, 2019. As is the tradition, the Polish Cultural Center Dom Polski is closed on Good Friday, Apr 19, 2019. The restaurant is also closed on Easter Sunday, April 21, 2019. The Spring Bazaar is an annual event organized by the Polish Women's Club / Koło Pań. The booths upstairs offer Polish crystal bowls and vases, amber and silver jewelry, pottery, crafts, books, Easter eggs and much more. Downstairs you can enjoy traditional Polish dishes served by the young waiters clad in Polish folk costumes. You can also buy home-made desserts and pastries. The Polish Choir Vivat Musica! will sing at 2:30 pm. New this year: special craft booth for kids. The Pacific NW branch of the Carpatho-Rusyn Society presents second annual Pysanki Workshop. Learn the beautiful art of pysanki, a folk art of Carpatho-Rusyn people (Rusini, Łemkowie). Where: Highland Park Improvement Club in Seattle; adults $12, children $6 - please not that registration is required at ak@c-rs.org; please send a mail indicating the number of adults & children to come, space is limited; registration by April 4 gives you a discount. The Polish Hall in Portland presents Celebration of Mazurkas and Young Artist Concert - a music and culinary event. In the program: young artists of Polish origin will play music that includes mazurkas by different composers. Polish mazurek cakes, an Easter tradition, will be served with coffee, tea and fine Polish liqueurs; there will be a contest for the best tasting mazurka pastry. The Polish Parish in Seattle invites everybody to the Holy Mass commemorating the 79th anniversary of the WWII Katyn massacre of Polish officers as well as the 9th anniversary of the catastrophe in Smolensk where President Kaczynski perished together with members of the Polish political and military elite. After the mass, the flowers will be laid at the Katyn monument with the Polish Scouts, guests and parishioners present. A reception with coffee and pastries to follow. The Young Polanie ensemble will be presenting a medley of Polish traditional songs and dances at the Seattle International Children's Friendship Festival. The SICFF features performances by the children highlighting different ethnic heritages. Also, all children are invited to visit the Polish booth with an interactive cultural display about Poland on April 6 from 11 am to 6 pm. More: SICFF website, for Young Polanie contact Barbara Strutynski, for the Polish cultural booth, contact Teresa Davis or call 206 948 8064. 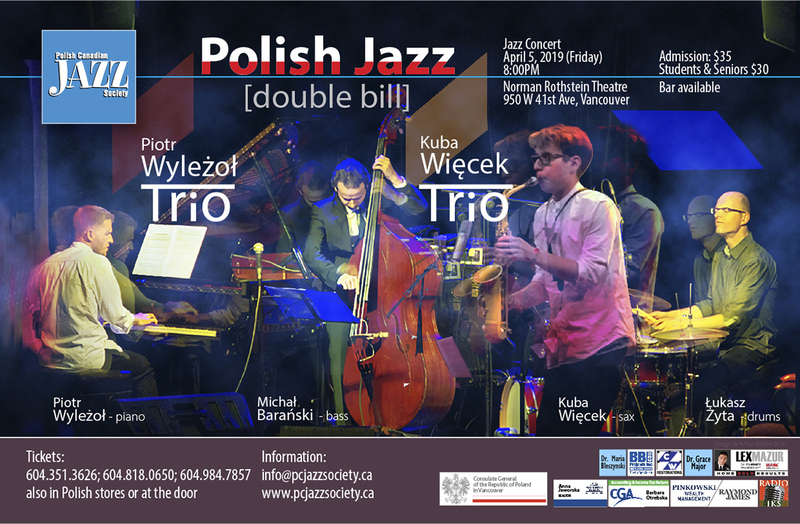 Polish Canadian Jazz Society presents a double bill concert featuring the Piotr Wyleżoł Trio and the Kuba Więcek Trio Four extraordinary musicians: Piotr Wyleżoł (piano), Kuba Więcek (sax), Michał Barański (bass) and Łukasz Żyta (drums) will provide a unique musical experience. The UW Scandinavian Studies Department presents a lecture For the Freedom of Captive European Nations: Eastern European Exiles in Postwar America by Martin Nekola. The talk will focus on development of political exiles' organizations representing Czechs, Poles and Baltic peoples in the USA during early Cold War Dr. Nikola is a Czech political scientist and historian focusing on Czech exile community after 1948. More: event description, UW PSEC.